May 22, 2015 - Los Angeles World Airports (LAWA) has selected Siemens to design and build an integrated operational flow visualization and management solution to support Los Angeles International Airport (LAX). 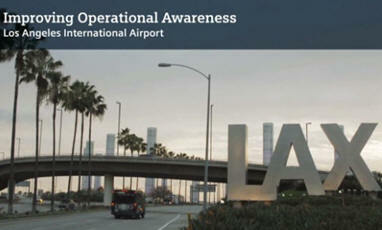 This real-time, airport data system is the first-of-its-kind to be installed at a U.S. airport. Working with the airport’s Operations and Emergency Management and Information Management and Technology Groups, Siemens is implementing Siamos, the Siemens Airport Management and Operations Suite. This management tool will significantly improves real-time operational decision-making capabilities for LAX and is already running at airports in Europe and Asia. The solution, a dynamic display console or Situation Status Display System (SSDS) – is being installed at the LAX Airport Response Coordination Center, where LAWA, the operator of the airport, monitors and manages airport operations during both normal operations and crisis situations. SSDS is based on Siemens’ airport management and operations tool (Siamos), which overlays and connects existing third-party systems in order to obtain mission critical data from external sources. The Siamos platform provides real-time, critical system snapshots of the airport’s operational condition and aids the airport in managing airside, landside and terminal operations. Siemens has a long-standing relationship with LAWA, and has helped gather requirements, define design parameters, and provide operational support and maintenance of its command and control and emergency operations center technologies and systems. Siemens is also currently installing a new baggage handling system in Terminal 1 at LAX for Southwest Airlines. Siemens designed SSDS and is implementing it as an airport operations flow visualization and management solution. The project is scheduled for completion in June 2015. Siemens also operates and maintains the Physical Security Information Management (PSIM) solution at the Airport Response Coordination Center.